I wrote before about Center Second and I find myself writing about another one again. 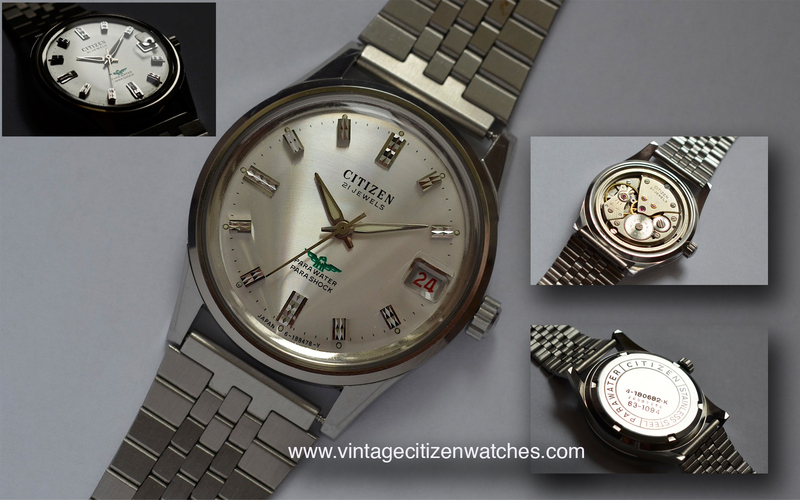 Here it is one of the most elegant, about 30mm diameter, Special Citizen Center Second. It was intended as both a men and a ladies watch but by today’s standards I would say ladies would find it more attractive due to its size. This is a NOS watch, with original strap and buckle and it is so nice to find one like this, the way it was meant to be in the first place. Lets not forget that it is almost 70 years old! The bezel details are really sharp and so are the crown threads. It is a very nice feeling to wind it, gripping the new crown and turning it. All the details are here, making it a Special one indeed. 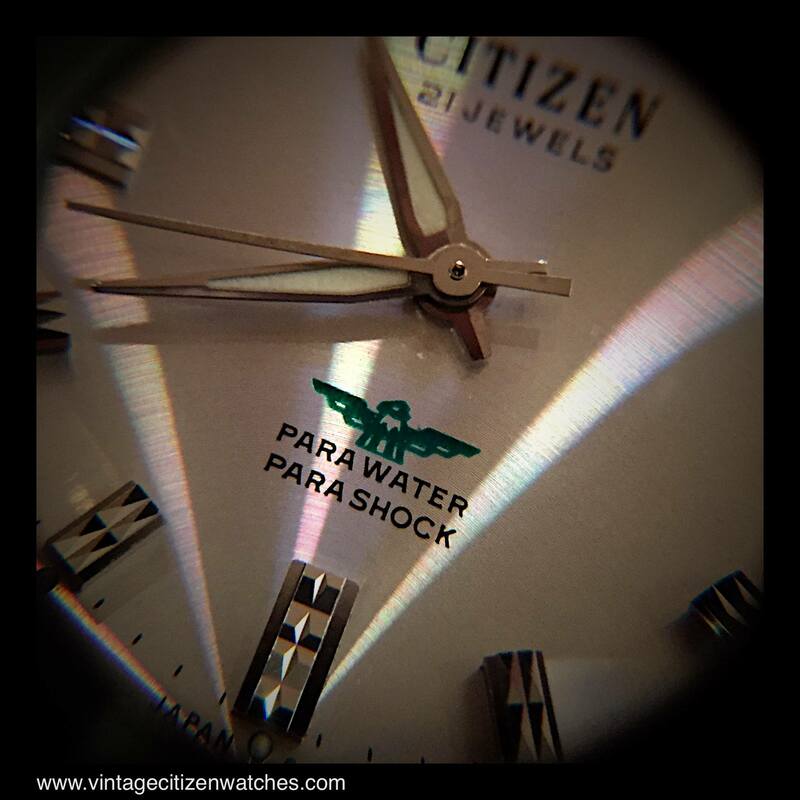 The dial, seen through the acrylic crystal, is beautiful, in two shades, a central one that has the writing “Special Citizen Center Second” and an outer part that has the applier golden hour markers, arabic numerals and dots for each minute. The three hands are are also golden. The “Center Second” came in many versions, and even a solid gold one, and a total of 6-7 generations for about 10 years. The first one was produced in 1948. All of them were running at 18,000 bph and came equipped with 7, 8, 9, 10, 11, 15, 16, 17 and even 19 jewels. The Center Seconds are non-hacking and don’t have a date complication. This watch can be dated around 1951. The calibre is a 10.5 ligne (23.30mm) one and can be made with 8,11, 16 or 17 jewels. It was a development of Citizen’s first wristwatch made in 1931, (read about it HERE) which was developed all the way up to 1955. 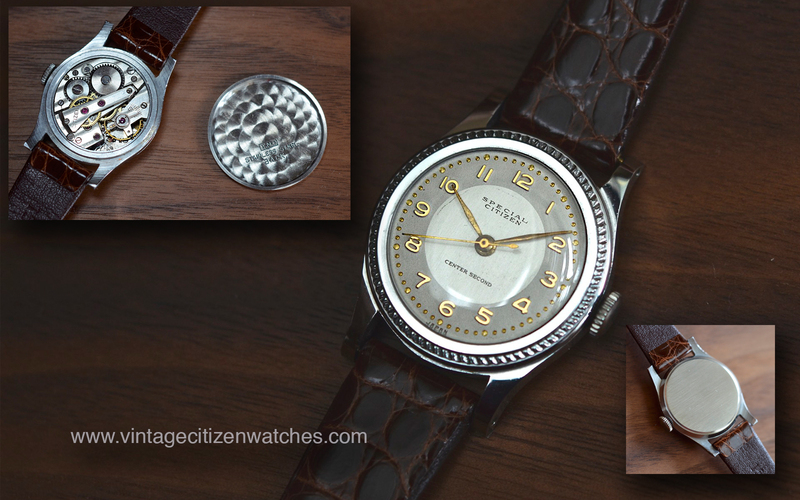 The earlier ones had a sub-second dial, then the Center Second models were introduced in 1948 as the “New Citizen”. The “Special Citizen” was the second version of the center second models. Read more about Center Second watches HERE.